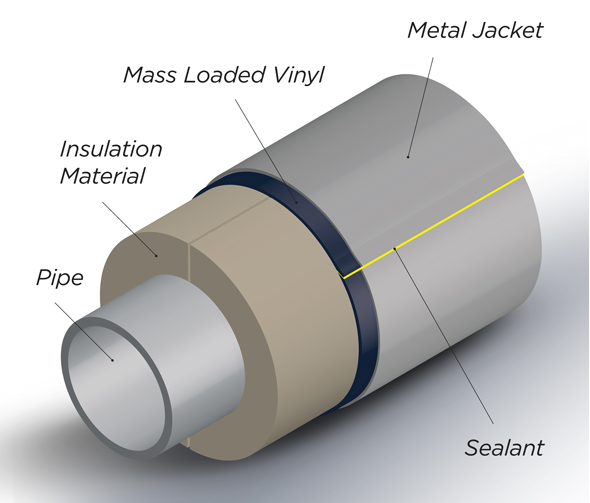 When creating insulation systems in the oil & gas industry, the separate application of steel and mass loaded vinyl (MLV) is problematic. These problems were solved by BS Stainless when we created SoundMet, an innovative product that combines the metal and MLV into a single component, dramatically increasing efficiency and cost-effec­tiveness. One big issue with MLV is due to its weight when used in vertical pipework or tanks its prone to slippage. This result is gaps were sound escape meaning an ineffective sound barrier. By bonding the vinyl to the steel it is impossible for the vinyl to move. Add the 15% increase in bond strength to the metal joints and improved acoustic performance. By using SoundMet you end up with a huge saving in labour costs and a much improved acoustic cladding system. Cost is one of the most important factors involved with making a business purchasing decision. This means that there is high demand across the spectrum of industry (including the automotive, cladding, power-generation and construction industries) for an effective, low-cost barriers for both sound and vibration, while not neglecting performance and safety. Bitumen sheet, which is versatile and relatively inexpensive, can be used as an alternative to MLV but is a poor substitute for several reasons. The product is difficult and expensive to recycle and it is also near-impossible to comply with REACH (Registration, Evaluation, Authorisation and Restriction of Chemicals) guidelines when using it. BS Stainless have developed alternatives to bitumen sheet that are available at a similar cost; these are VibroMat (without metal) and VibroMet (with metal); both products are manufactured using PVC which can readily be recycled. It can be bonded to any kind of metal from stainless steel to aluminium and can be supplied with a peel-off adhesive backing if required. VibroMat and VibroMet allow industries to purchase factory-applied acoustic barriers at the most competitive market price while still maintaining impeccable envi­ron­men­tally-friendly credentials. Our technical team are always on-hand to offer expert advice as required. Find out more on our website.